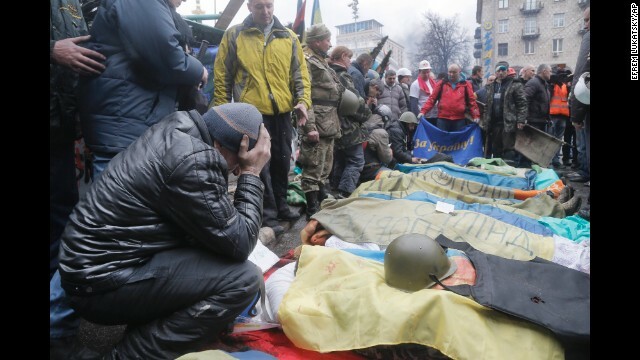 Truce declared in bloodied Ukraine, but will it last through talks? Opposition leader says "now we will see' if president "will stick to his word"
Are you in Ukraine? Send us your photos and experiences but please stay safe. 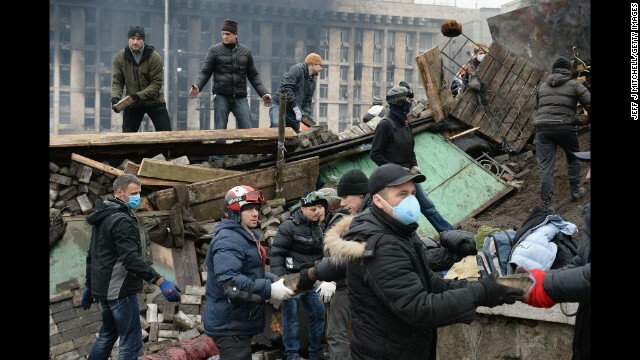 Kiev, Ukraine (CNN) -- Just before midnight Wednesday, Ukraine's president declared a truce in his tumultuous nation, as well as the start of negotiations aimed at not only preventing further bloodshed but forging a lasting peace. The statement -- agreed upon with leaders of Ukraine's three top opposition parties -- seemingly offered a respite from the violence and acrimony that's marred the last few weeks. Still, there have been talks before. There was a breakthrough as recently as four days ago, when protesters agreed to move out of Kiev's City Hall and unblock downtown streets. 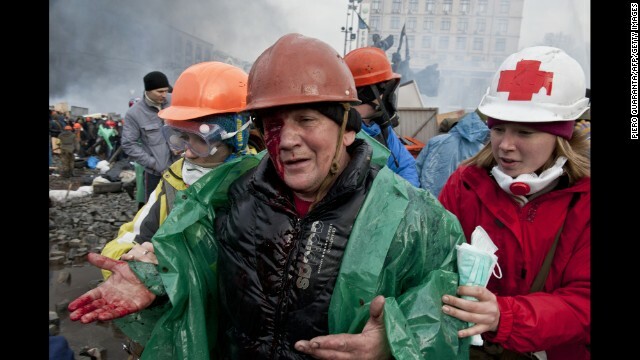 Then it collapsed in a bloody mess Tuesday on the streets of Kiev. So will this attempt be any different? 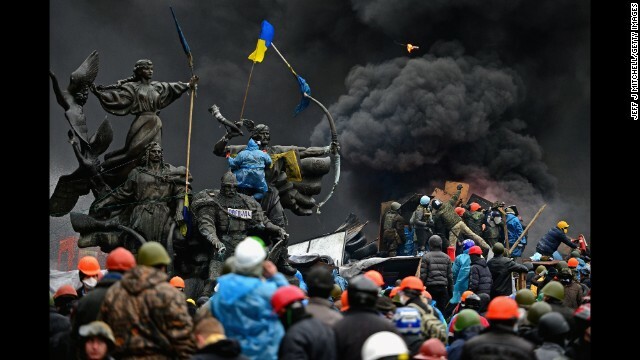 One thing that has changed is the scale of the violence: Authorities say at least 26 people -- protesters and police alike -- were killed in fierce clashes centered around Kiev's Maidan, or Independence Square. Protesters in Kiev, Ukraine, cheer Friday, February 21, after news of an agreement between the government and opposition leaders. Violence recently intensified in Kiev's Independence Square, which has been the center of anti-government protests for the past few months. 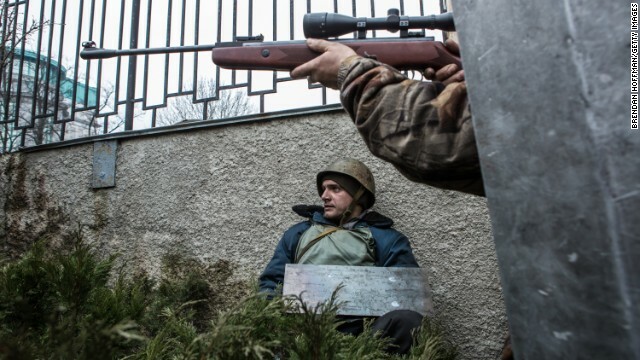 A protester aims a gun in the direction of suspected sniper fire in Kiev on Thursday, February 20. Thousands of anti-government demonstrators have packed Independence Square since November, when President Viktor Yanukovych reversed a decision on a trade deal with the European Union and instead turned toward Russia. 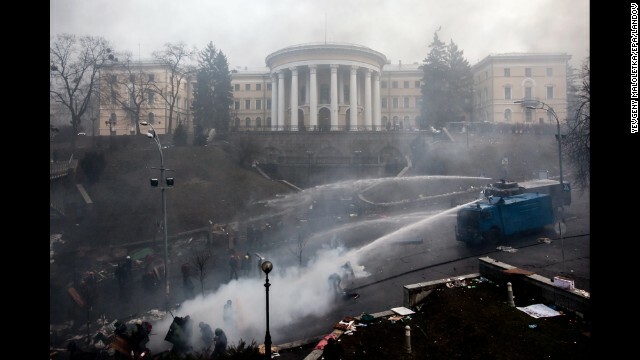 Police use water cannons against protesters in Kiev on February 20. 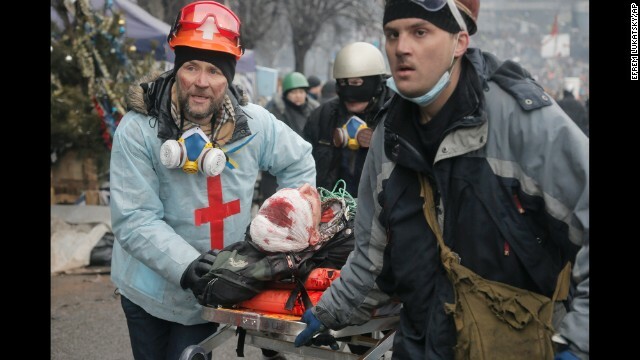 An injured protester is carried away from Independence Square on a stretcher February 20. 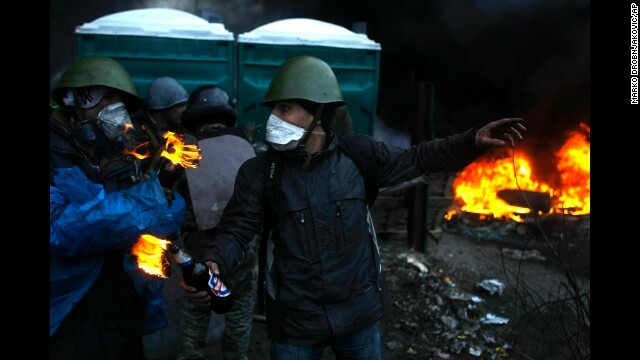 A protester gives directions before throwing Molotov cocktails on the outskirts of Independence Square on February 20. 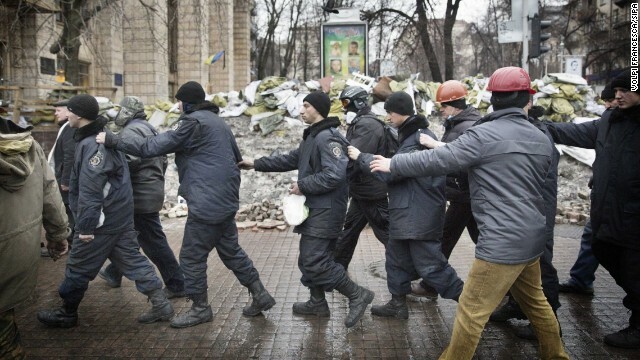 Captured police officers are led away by protesters in Kiev on February 20. 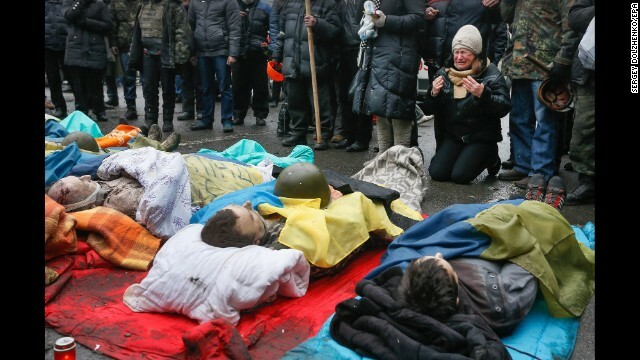 A woman on February 20 mourns over protesters who were killed during clashes. Protesters rebuild barricades in Independence Square on February 20. 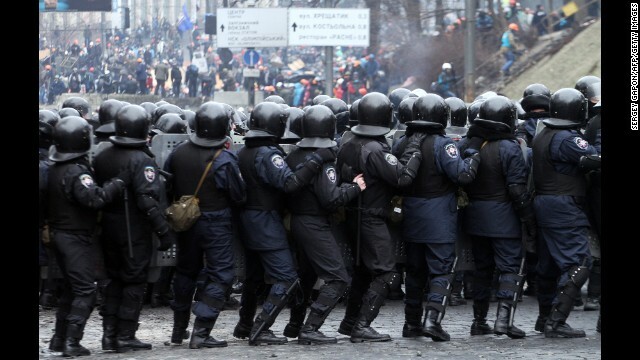 Riot police face protesters in Kiev on February 20. Protesters man a barricade on the outskirts of Independence Square on February 20. Activists pay their respects to protesters who were killed in clashes with police in Independence Square on February 20. 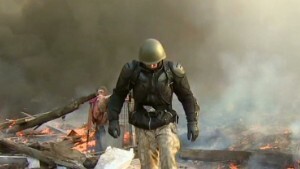 An injured protester is evacuated from Independence Square on February 20. 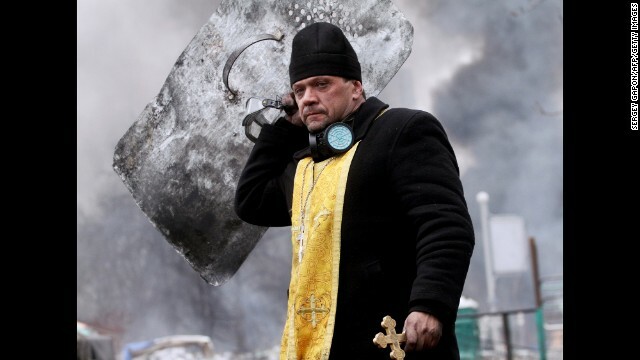 A priest walks with a cross and shield during clashes in central Kiev on February 20. 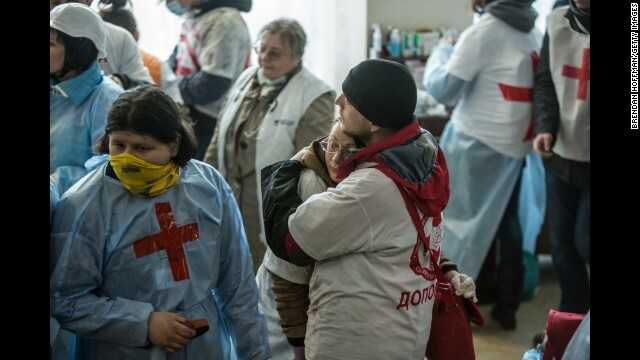 Medics embrace in the lobby of the Hotel Ukraine on February 20. 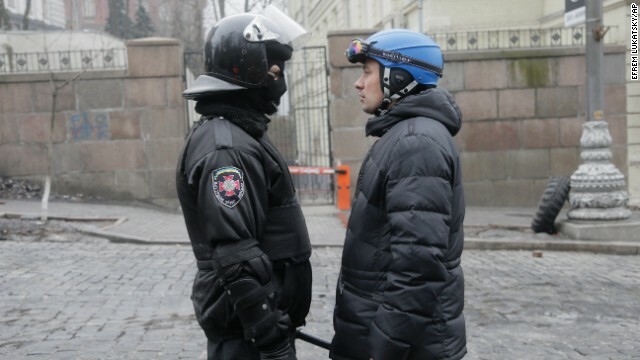 A high-ranking police officer, left, and a representative for the protesters speak with each other near the Cabinet of Ministers in Kiev on February 20. 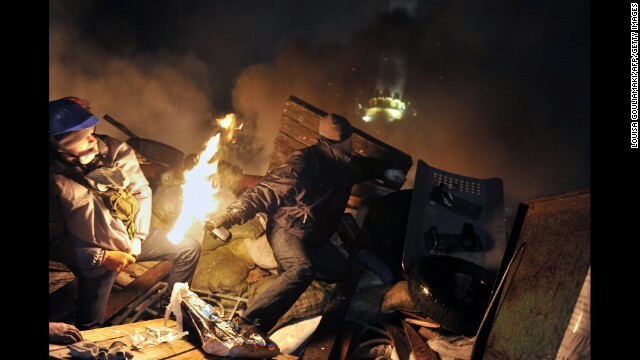 Protesters light Molotov cocktails in Kiev on February 20. 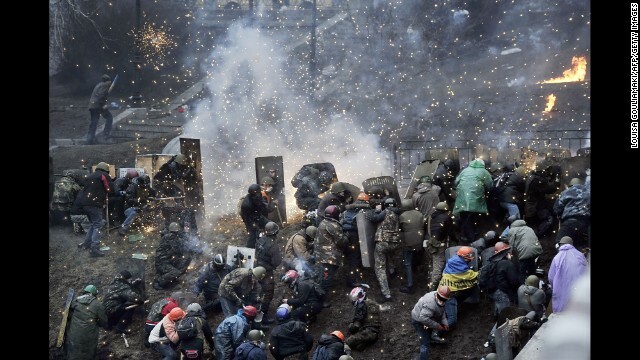 Activists reinforce the barricades in Kiev on February 20. Protesters clash with police in Independence Square on February 20. 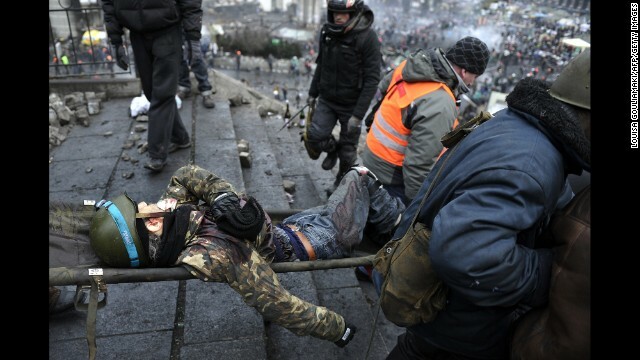 Protesters move up an embankment in Kiev on February 20. 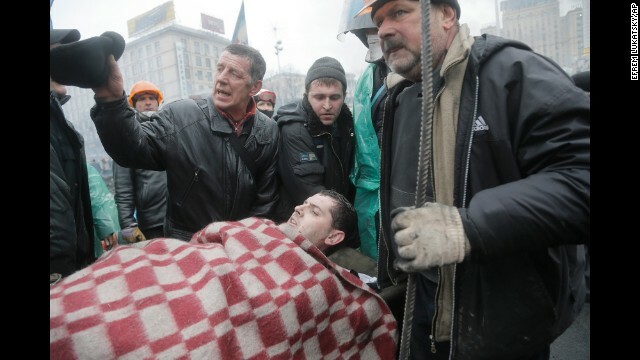 An injured demonstrator is carried away from Independence Square on February 20. A protester shouts during clashes with police on February 20. 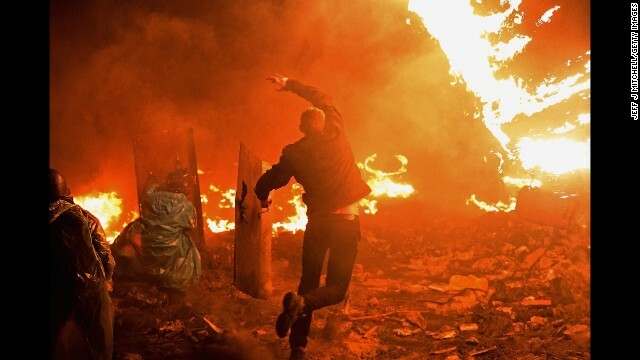 Protesters run from a burning barricade in Kiev on February 20. 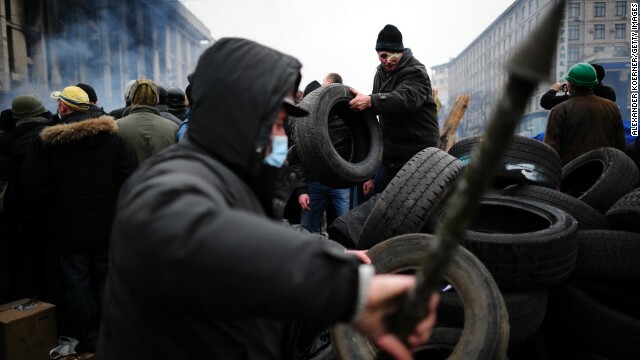 A protester rolls a tire toward burning barricades on February 20. 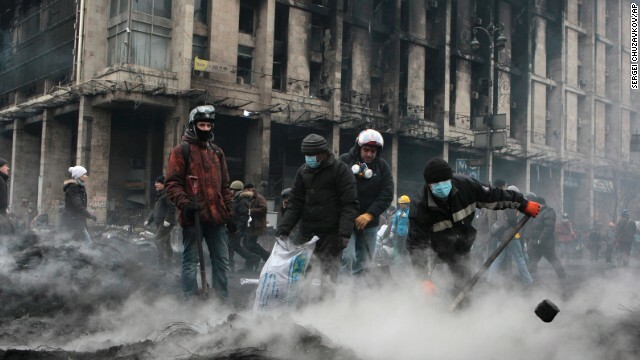 Protesters advance to new positions in Kiev on February 20. Fireworks explode over protesters near Independence Square on February 20. 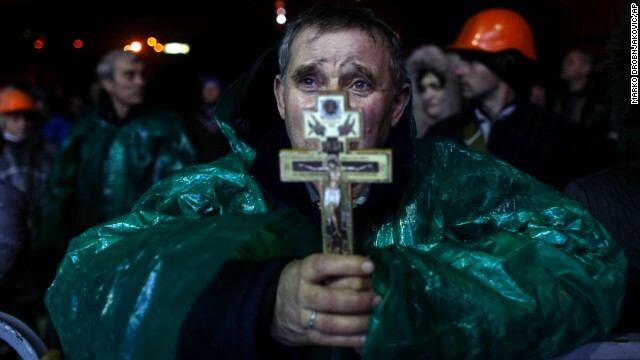 A protester holds a crucifix as he prays in Independence Square on February 20. 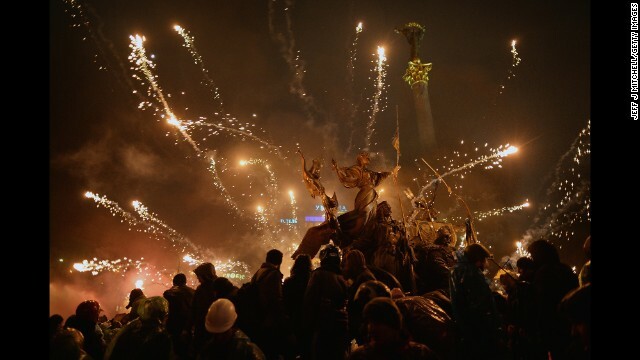 Fireworks explode over protesters in Independence Square on Wednesday, February 19. 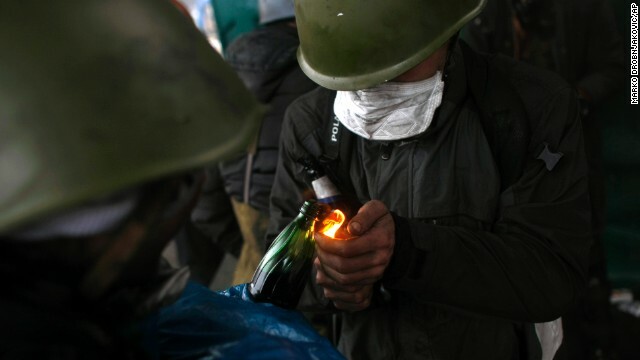 A protester throws a Molotov cocktail in Kiev on February 19. Protesters clash with police in Independence Square on February 19. Protesters use a compressed air cannon to launch a Molotov cocktail toward police lines in Independence Square on February 19. A protester hurls a Molotov cocktail toward police on February 19. 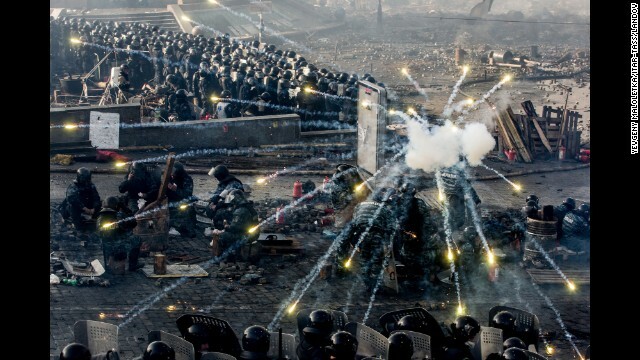 Police take cover behind shields as fireworks go off in Kiev on February 19. Protesters prepare a barricade in Independence Square on February 19. Police form a barrier in Independence Square on February 19. Protesters throw rocks at riot police in Independence Square on February 19. Independence Square smolders during protests on February 19. 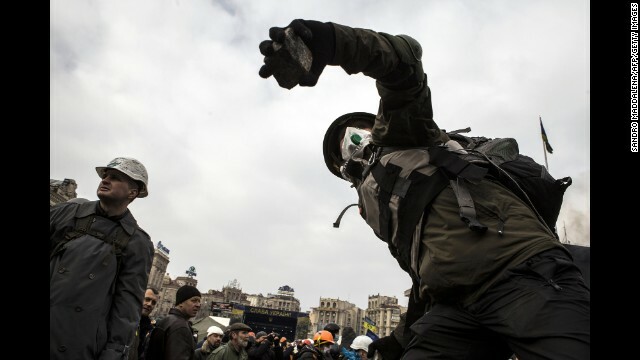 A protester throws a cobblestone at riot police during clashes in Independence Square on February 19. 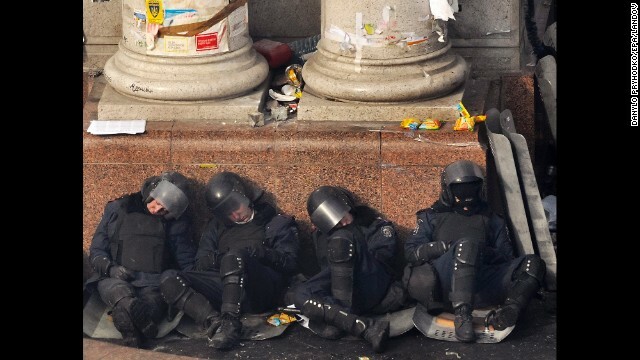 Riot police officers rest against a column in Independence Square on February 19. 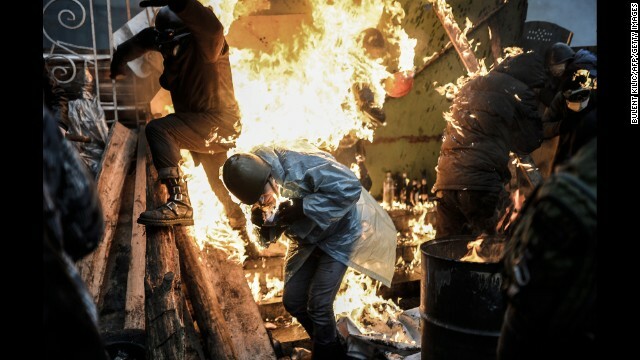 An injured protester is moved out during clashes with riot police in Kiev on February 19. 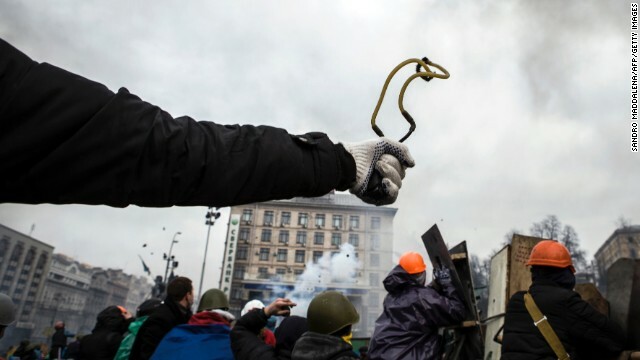 A protester uses a slingshot to throw a rock at riot police February 19 in Kiev. 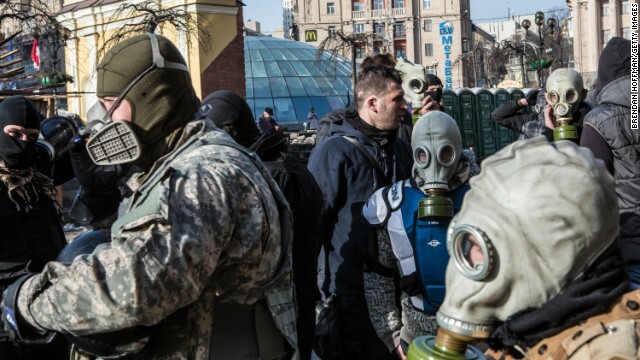 Protesters put on gas masks near the perimeter of Independence Square on February 19. 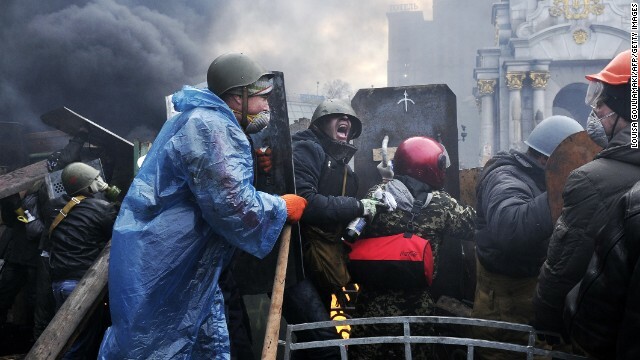 Protesters protect themselves with shields as they clash with police in Kiev on February 19. 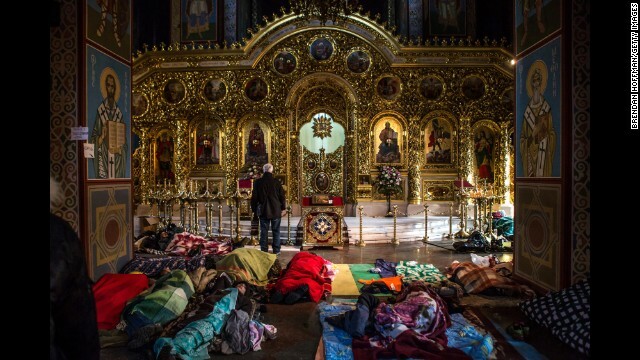 Protesters sleep on the floor inside a Kiev monastery on February 19. A protester rushes through a broken door in the regional prosecutor's office in Lviv, Ukraine, on February 19. Police said the unrest has spread to western Ukraine, with protesters attacking police and local government offices in a number of regions. 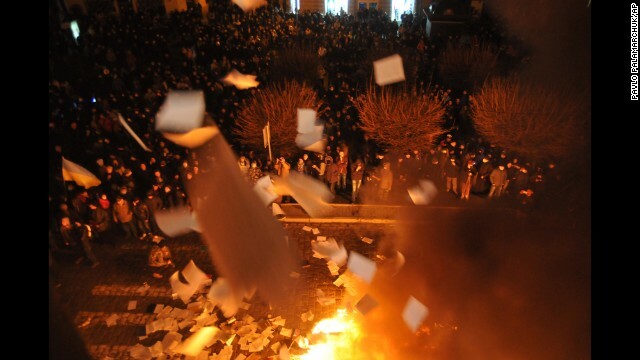 Protesters in Lviv burn papers from a government building on February 19. 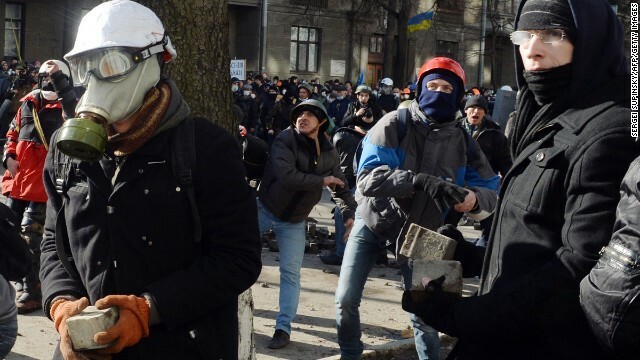 A protester aims a weapon in Kiev on Tuesday, February 18. 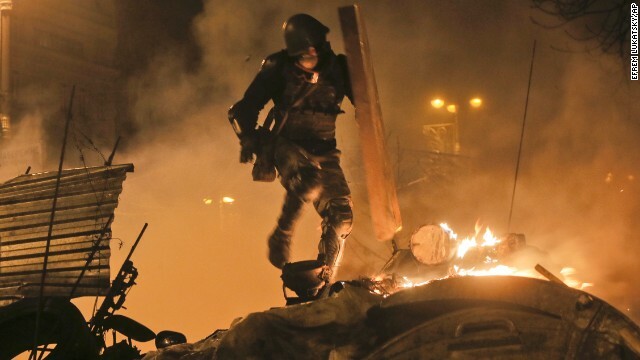 A protester runs during clashes with police in Kiev on February 18. 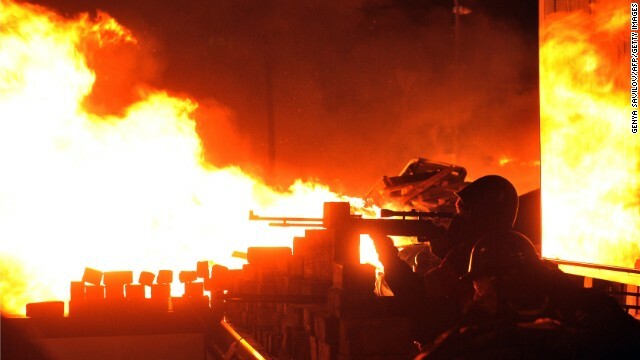 Violence between police and protesters escalates February 18 in Kiev. 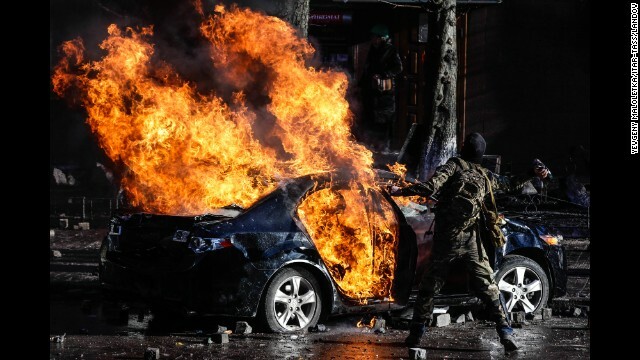 Protesters burn a car in central Kiev on February 18. 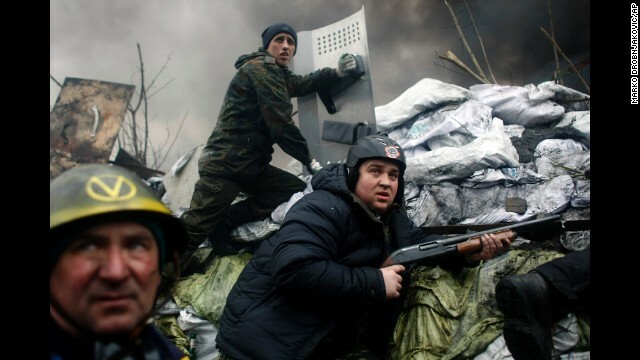 A protester stands atop a barricade in Kiev on February 18. 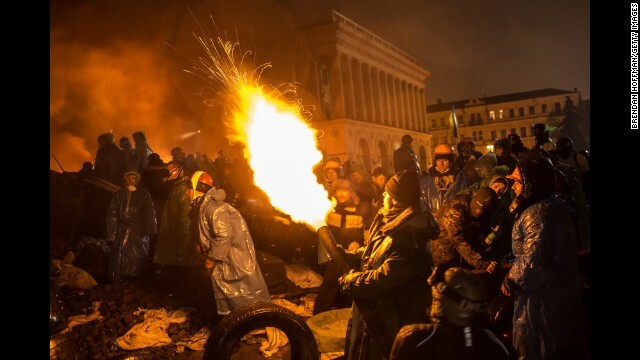 Protesters clash with riot police outside Ukraine's parliament in Kiev on February 18. 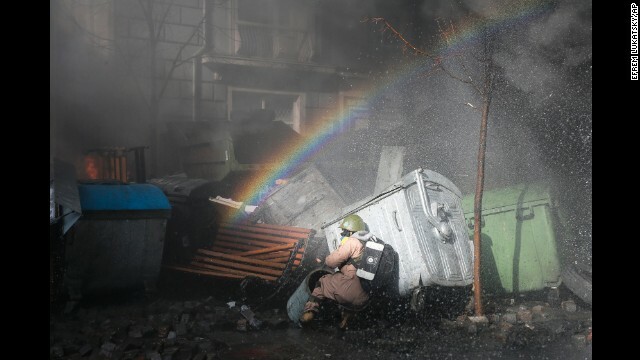 A rainbow forms over a protester ducking for cover in Kiev on February 18. 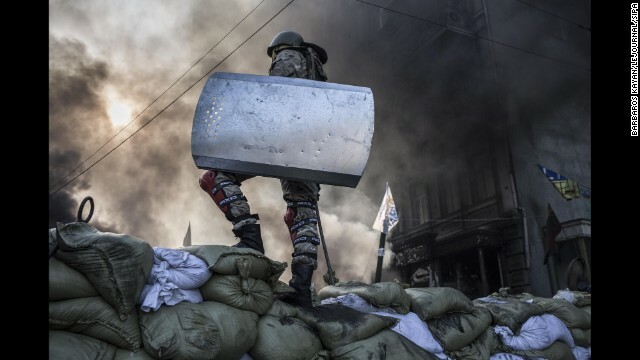 Riot police protect themselves during clashes in Kiev on February 18. 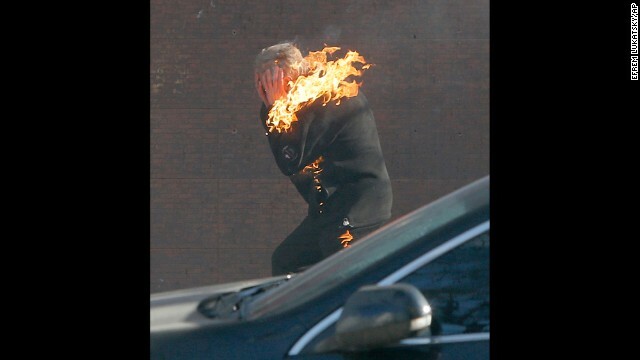 A protester is engulfed in flames while running from the clashes in Kiev on February 18. 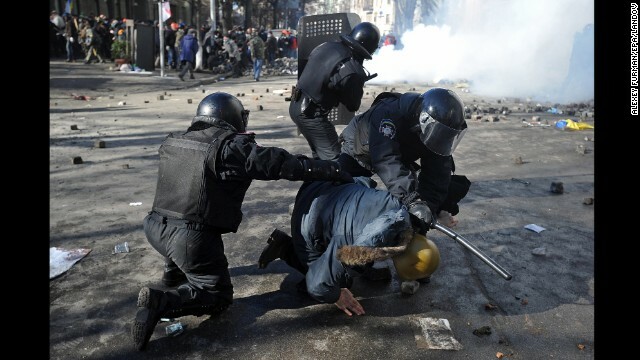 Riot police detain a protester in Kiev on February 18. 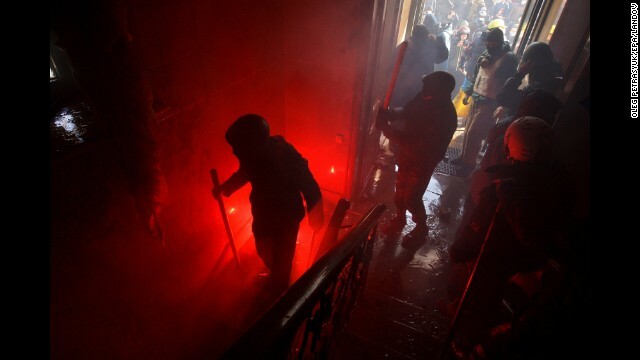 Protesters invade the main office of the ruling Party of Regions in Kiev on February 18. 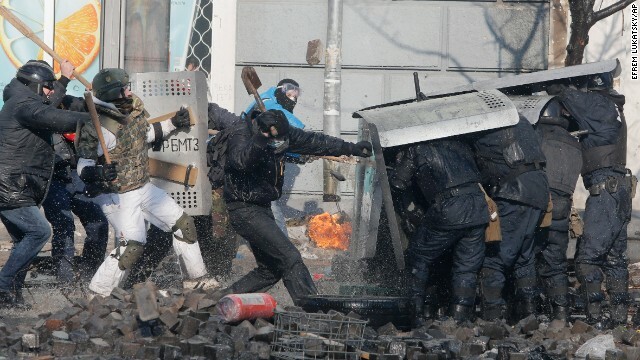 Riot police shield themselves during clashes with protesters on February 18. 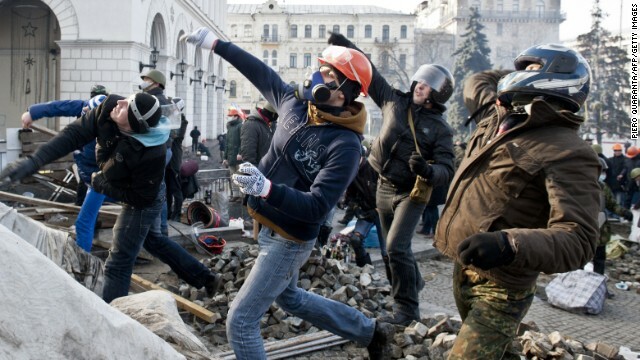 Protesters throw stones toward riot police in Kiev on February 18. The international outrage also has ratcheted up. After weeks of behind-the-scenes work and general calls for a peaceful resolution, Western leaders ramped up their pressure on Wednesday. As U.S. President Barack Obama said, "We're going to be watching closely." He and other Western leaders offered pointed remarks -- and floated possible sanctions -- against Ukraine's embattled government for its part in the recent violence. 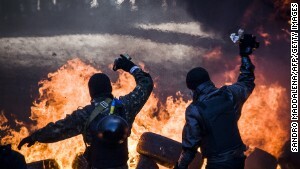 "We hold the Ukrainian government primarily responsible," Obama said, "for making sure that it is dealing with peaceful protesters in an appropriate way, that the Ukrainian people are able to assemble and speak freely about their interests without fear of repression." 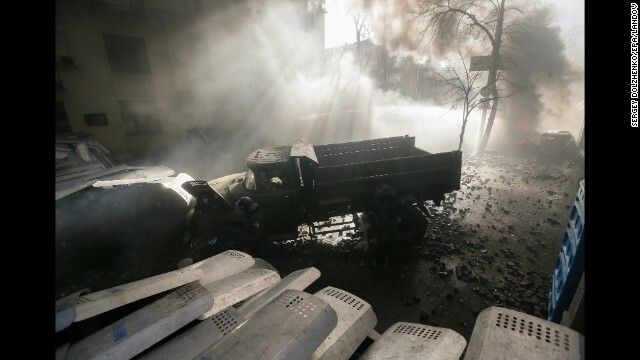 If there is a truce, it wasn't evident overnight Wednesday in central Kiev. Persistent explosions rattled the night sky, the apparent product of protesters' fireworks, security forces' stun grenades and whatever else. Demonstrators continued to pick up pavement and rocks, then throw them at police. Security forces themselves responded, including in some cases throwing Molotov cocktails in protesters' direction. 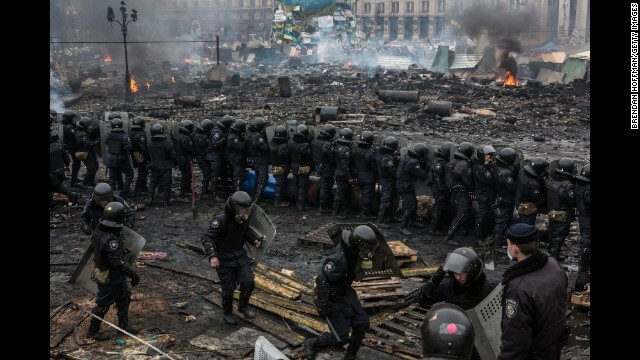 "The government would like the world to believe that those on Maidan are just terrorists and extremists to justify the bloodshed,... that those on Maidan are armed with firearms and rioting," Kiev protester MaiaKiev told CNN iReport. "But it's not a riot ... It's a revolution of dignity." The situation began in November, when the opposition hit the streets angry about Yanukovych's backpedaling from a trade pact with the European Union. That move and Russia's offer the following month to buy $15 billion in Ukrainian debt and slash the price Kiev pays for its gas played into the storyline of Ukraine being a proxy for battles between Russia and the West. Yet this dispute goes beyond international affairs. It's also about who controls Ukraine's future and how, as seen in the opposition's pressing for constitutional reforms shifting powers from the president to the parliament. The government's response to the dissent -- including a sweeping, if short-lived, anti-protest law in January -- further inflamed the opposition. 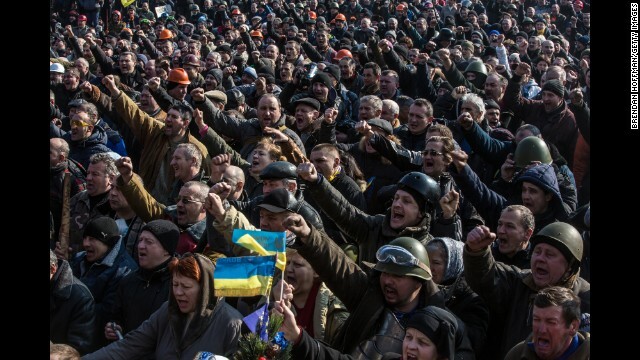 While the protests in Maidan have been a constant, there have been ebbs and flows in the unrest. The most sudden shift came on Tuesday, two days after a seeming breakthrough. Riot police plowed through the streets with water cannons, stun grenades, night sticks and, in some cases, armored personnel carriers. 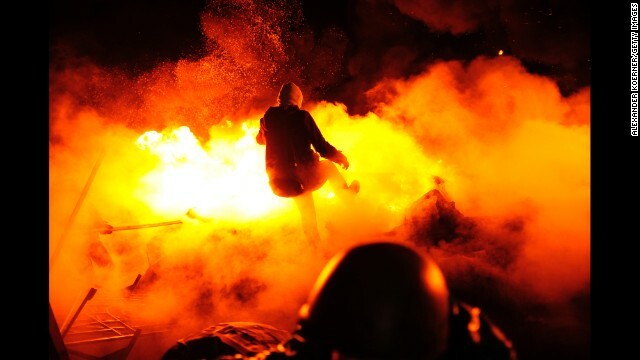 Protesters fought back, with some clawing paving stones from the streets and firing Molotov cocktails attached to fireworks from an improvised air cannon. 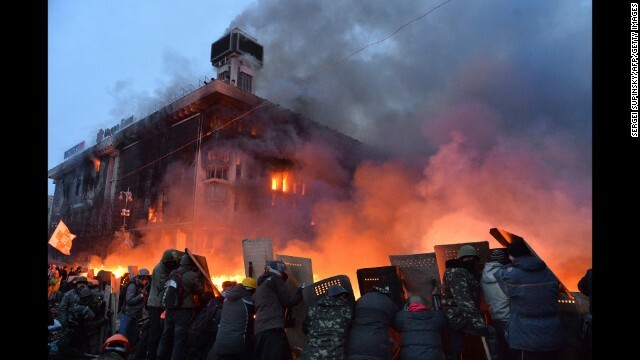 They even set fire to the headquarters of the headquarters of the ruling Party of Regions. Overnight Tuesday, the situation had become a standoff. The security forces maintained on alert and so did demonstrators, refusing to budge from their physical position in the center of Ukraine's capital as well as their political positions. 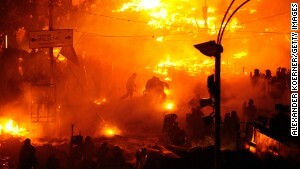 A ring of fire continued to burn along barricades around their camp in the city center. Their cries against President Viktor Yanukovych are continuing too -- accusing him of scuttling an European Union trade pact to cozy up with Russia, resisting reforms that might curb his power and stubbornly, heavy-handedly dealing with the opposition. 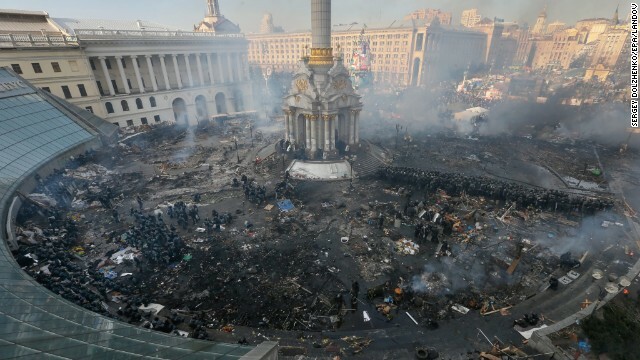 As to the Ukrainian government, while security forces held back Wednesday, its officials did not. 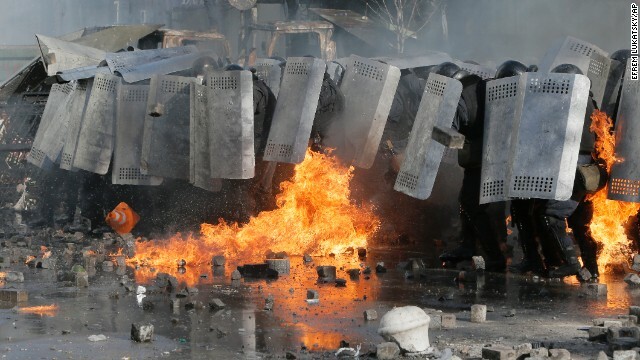 In an interview with CNN's Christiane Amanpour, Foreign Minister Leonid Kozhara said an opposition march Tuesday "ended with massive riots and aggressive and excessive attacks against the Ukrainian police." The head of Ukraine's security service was even more forceful, accusing protesters of taking over government offices nationwide and looting 1,500 weapons and 100,000 rounds of ammunition, among other misdeeds. "These are concrete acts of terror," Oleksander Yakimenko said in a statement announcing an anti-terrorism operation apparently targeting protesters. "Radical and extremist groups are now a real threat." Yakimenko spoke hours before the announcement of the truce, which two of the opposition leaders -- Vitali Klitschko and Arseniy Yatsenyuk -- later confirmed. Klitschko, a former world-class boxer who now leads the Ukrainian Democratic Alliance for Reform party, said the next round of talks will take place Thursday. 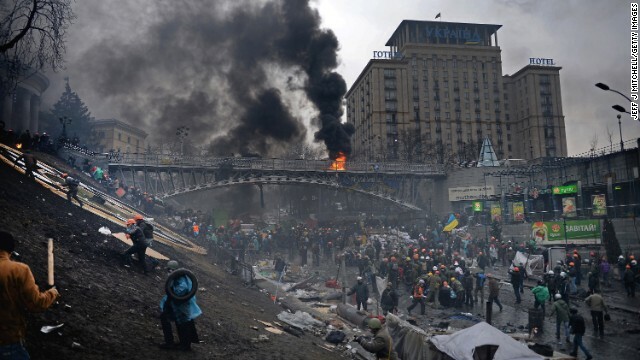 Until then, Yanukovych has promised that there will be no further attempts to disperse protesters in Maidan, according to a statement on Klitschko's party's website. "Today, a key goal is to stop the bloodshed that authorities have provoked and unleashed," Klitschko said. "Now we will see how Yanukovych will stick to his word after promised sanctions from the West." One man who won't be part of the government's anti-terrorism campaign is Ukraine's armed forces chief. Col. Gen. Volodymyr Zamana has been replaced, according to a statement Wednesday on the president's website. No reason was given for the dismissal of Zamana, who according to his official bio started in the Soviet military, then rose through the ranks of Ukraine's military before getting the top job in February 2012. U.S. General Philip Breedlove, the military commander for NATO -- the 23-nation alliance including not just Western Europe and the United States, but Ukraine's neighbors Poland and Romania -- called "upon the new military leadership in Ukraine to open a dialog (sic) with us to bring this situation to a peaceful resolution." In his CNN interview Wednesday, Ukraine's foreign minister insisted that -- despite what he characterized as protesters' provocations -- police have "strong instructions" to avoid using "offensive means." And Kozhara rejected reports that the army, whoever leads it, has been authorized to fire on protesters. "Under no conditions (will) the Ukrainian army ... be used in resolving this political crisis," the minister added. Over the course of a few hours overnight Wednesday, Ukrainian troops moved into defensive positions around bases and weapons depots, according to a U.S. defense official familiar with the latest intelligence. The move is seen by the United States as an effort to ensure the military's facilities remain secure. After some well-reported infighting about how engaged they'd been in the crisis, Western officials were vocal on Wednesday not just condemning the violence but threatening action. 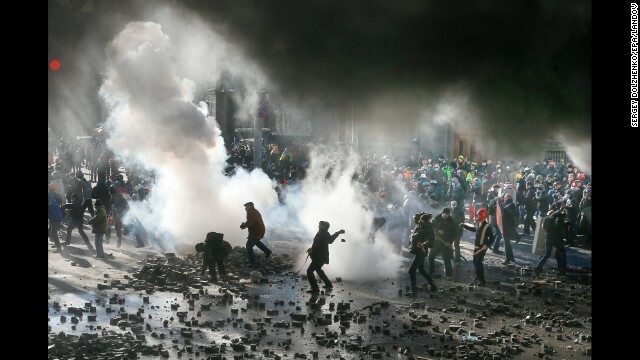 The foreign ministers of France, Germany and Poland are set to to travel to Kiev on Thursday to survey the situation, before briefing their European Union colleagues in Brussels. After that, they and their U.S. allies could impose sanctions against Yanukovych's government -- especially if there is even more violence. European Commission President Jose Manuel Barroso vowed European officials will "respond to the any deterioration on the ground" with "targeted measures against those responsible for violence and use of excessive force." U.S. Secretary of State John Kerry said that Yanukovych must decide "between protecting the people that he serves -- all of the people -- ... versus violence and mayhem." "We are talking about the possibility of sanctions or other steps with our friends (in) Europe and elsewhere in order to create the environment for compromise," Kerry said. Later Wednesday, a senior State Department official told reporters that the United States wouldn't issue visas for 20 senior members of the Ukrainian government and others responsible for Tuesday's violent crackdown on protesters. 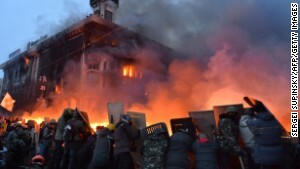 Calling the violence from both government forces and protesters "completely unacceptable," British Prime Minister David Cameron challenged Ukraine's leaders to make the public's safety their first priority. "President Yanukovych has a particular responsibility to pull back government forces and de-escalate the situation," Cameron said. Such measures could affect individuals but not likely the larger situation short term, said Richard Haass, president of the Council on Foreign Relations. Military action seems highly unlikely, and Russia appears poised to help Ukraine's government if economic sanctions were imposed, he said. "We really don't have very good options to introduce," Haass told CNN. 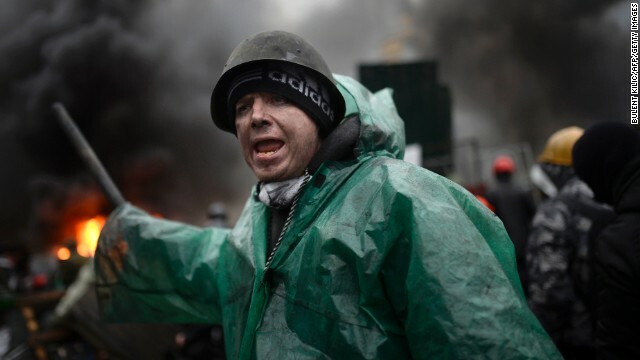 CNN's Nick Paton Walsh and Victoria Butenko reported from Kiev, while CNN's Greg Botelho reported and wrote from Atlanta. CNN's Phil Black, Michael Pearson, Anna Maja Rappard, Barbara Starr, Elise Labott, Jake Tapper, Matt Smith, Ben Brumfield, Michael Martinez, Neda Farshbaf, Larry Register and Radina Gigova contributed to this report. Donetsk's neediest line up for food handouts. There are long queues at the bus station as people try to leave town. There are no banks left open. Barking overwhelms the thud of artillery fire. An animal shelter is crammed with 1,000 dogs, many orphans of the conflict with owners who have fled or been killed. Reza Sayah looks into why thousands of Ukrainians have left their old lives to volunteer to fight. CNN's Ralitsa Vassileva speaks to The New Republic's Linda Kinstler about Putin's motives with Ukraine and China. President Barack Obama speaks at the 69th session of the United Nations General Assembly. The Commander of NATO forces in Europe says Russian tanks, Russian artillery, Russian air defense systems and Russian troops -- all heading into Ukraine. Malaysia Airlines Flight 17 broke apart in the air after it was hit by a burst of "high-energy objects" from outside, a preliminary report by Dutch aviation investigators said Tuesday. On a country road in eastern Ukraine, a scene of bucolic tranquility was suddenly interrupted by the aftermath of carnage. In the city of Donetsk, the devastation wrought by weeks of fighting between pro-Russia rebels and Ukrainian forces is all too apparent. 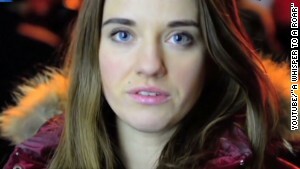 CNN's Diana Magnay reports from the front lines in the Ukrainian conflict. A few miles south of the town of Starobeshevo in eastern Ukraine, a group of men in uniform is slumped under a tree. A shopkeeper's mutilated body, relatives' anguish, homes destroyed ... this is Donetsk. A 20-minute drive from Kiev takes you to a neighborhood that feels more like Beverly Hills than central Ukraine. 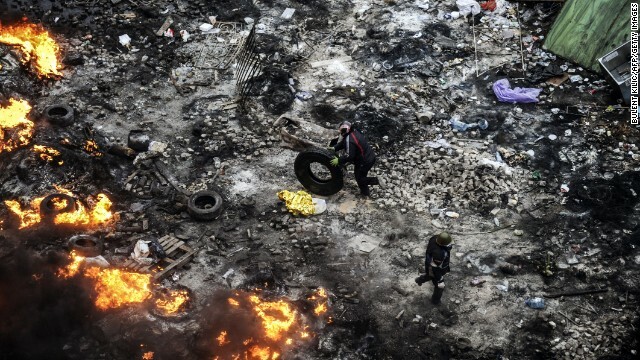 Photos illustrate the ongoing crisis in Ukraine as fighting continues to flare in the region. Future imports, exports between the EU and Russia are now banned -- but existing contracts continue. Some contend that larger weapons have come into Ukraine from Russia. Who are Ukraine's pro-Russia rebels? The downing Malaysia Airlines Flight 17 put the pro-Russia rebels operating in Ukraine's eastern region center stage.